Author(s): Claudio Spinelli, Department of Surgical, Medical, Pathological, Molecular and Critic Area, University of Pisa, Via Paradisa 2, 56124 Pisa, Italy. Silvia Strambi, Leonardo Rossi, Rossella Elisei, Maura Massimino. Medullary thyroid carcinoma (MTC) is a rare, accounting for 5% of thyroid malignancies. It is a neuroendocrine tumor wich origins from thyroid parafollicular cells. It may be sporadic, mostly in adult patients, or inherited as autosomal dominant pattern, mostly in pediatric patients. As familial cancer, MTC may presented isolated as familial medullary thyroid carcinoma (FMTC) – 10% of cases - or, most often, as part of multiple endocrine neoplasm type 2 (MEN 2A or MEN 2B) syndromes – 90% of cases. 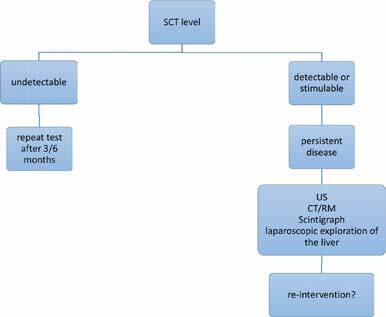 The therapy for sporadic or hereditary MTC is surgical resection and consists in total thyroidectomy associated with central compartment lymph nodal dissection; the radicality of this intervention is fundamental to obtain a definitive cure. Genetic screening in children of parents with MEN2 or FMTC has led to prophylactic total thyroidectomy. The type of prophylactic surgery required is focus of great attention, and it is reported that total thyroidectomy, central neck dissection associated with parathyroid autotransplantation is the proper management. In children, the recommended age of surgery based on genetic testing is 5 years for patients with MEN 2A and FMTC, and 1 year for children possessing the RET mutation responsible for MEN 2B. The surgical management changes depending on the type of codon mutated. Keywords: Adolescent surgery, children surgery, medullary thyroid carcinoma, MEN2A, MEN2B, RET proto-oncogene. Keywords:Adolescent surgery, children surgery, medullary thyroid carcinoma, MEN2A, MEN2B, RET proto-oncogene. Abstract:Medullary thyroid carcinoma (MTC) is a rare, accounting for 5% of thyroid malignancies. It is a neuroendocrine tumor wich origins from thyroid parafollicular cells. It may be sporadic, mostly in adult patients, or inherited as autosomal dominant pattern, mostly in pediatric patients. As familial cancer, MTC may presented isolated as familial medullary thyroid carcinoma (FMTC) – 10% of cases - or, most often, as part of multiple endocrine neoplasm type 2 (MEN 2A or MEN 2B) syndromes – 90% of cases.